Usually, when someone says March Madness in reference to the college basketball championship tournament, my eyes glaze over. I'm not so into sports. Can you tell? 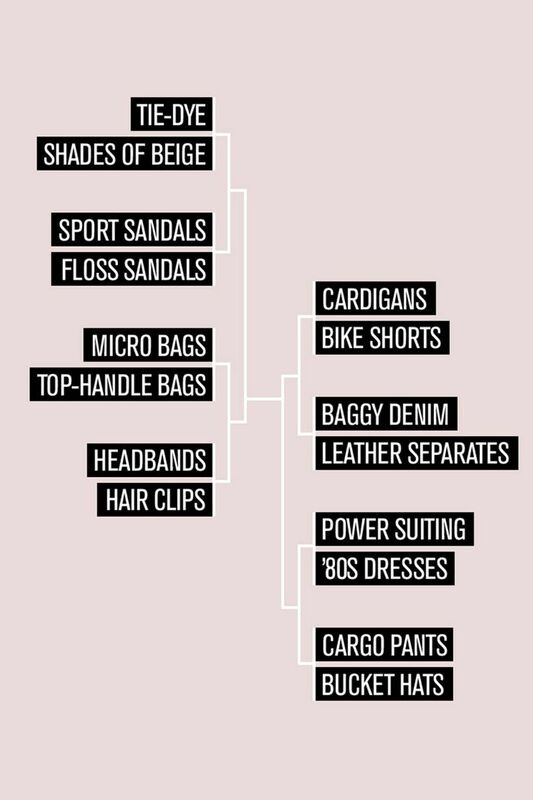 But I'm always down for some good old competition, and I'm pretty sure I'm not alone there, so I created Who What Wear's very own version of a March Madness bracket, in which the best spring fashion trends could go head-to-head. At this point in the season, you've had enough time for all the major spring trends to sink in, making their way from the runway to the street to your Instagram feeds and possibly even in your closets already. Since you also happen to read Who What Wear, you're well aware of what's cool in fashion right now, and chances are you've formed an opinion on everything you're seeing. So we left it up to you, our readers, to vote in three separate rounds and narrow it down from sixteen trends to today's final four. Was tie-dye or beige be more popular? Headbands or hair clips? Well, the results are in, and only one trend could ultimately come out on top. To find out the winning spring trends from fourth to first place and then shop our picks of each one at every price point, keep reading. The word cardigan sounds about as cool as my grandmother's Instagram presence, but thanks to fashion's constant ebb and flow, the staple knit we used to think of as "boring" is actually trending hard for spring. Whether shrunken à la the '90s or tucked into high-waisted jeans, the fashion crowd gave us so many styling ideas when it comes to wearing the It piece. Seeing as our readers kept it in the running for two rounds of our March Madness trend battle, it's clearly become a mainstream hit. Move over, crossbodies. The only bag trend that matters this year is the top-handle bag. The vintage-inspired shape lends a polished feel to just about any outfit, and although the bag is considered a trend, the styles on offer are all as timeless as they come, so invest in one now, and your future self will thank you for it. This spring, suiting separates were doused in creative colors and came in unexpected cuts. No longer does the pantsuit connote stuffy corporate attire. Nay, it's become a necessary element to build any forward and on-trend wardrobe. Dressed up with pumps or down with sneakers and a tee, power suiting ensures you'll always look pulled-together no matter what. Shop the matching Taylor Mid-Rise Pants ($425). Shop the matching Wool Wide-Leg Pants ($315). Shop the matching Elastic Waist Trousers ($80). On January 4, 2019, we published a story predicting that beige would dominate our feeds this spring, and, not to toot our own horn or anything, but we were right. Our Instagram feeds continue to be flooded with fashion girls outfitted in head-to-toe earth tones, mixing varying shades of camel, beige, and cream for a neutral and intriguing (read: not boring) look. Of all the trends to choose from this spring, it's none other than these elevated neutrals that came out victorious. Next, the shoes nine fashion insiders say will blow up this spring.